That is really shoving our noses in it, the American steel workers that build bridges and never built this one. We are suppose to join this big celebration that maybe over 2000 Chinese worked over two years to build? The other day on the news it showed Govt. Brown talking about how the original bridge was built in 1936 during the depression. He was referring to our pride　that in hard times　we built that bridge　by American workers　with American steel　and we had a lot of pride in that American Built Bridge. Now it is a Chinese Built Bridge with Chinese Steel, shipped here on foreign ships and put up by American workers. 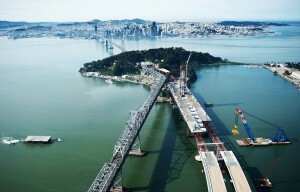 A Chinese Oakland Bridge. What is the matter with this Governor? Oh, it is the bridge that he wanted when he was Mayor of Oakland, the prettiest and cheapest bridge for his side of the Island. We needed the work for our people not for the Chinese worker. It was American money going overseas again. Now he wants a celebration for this Chinese masterpiece. Our American steel and manufacturing plants are going overseas. American Bridge built this bridge in China. Brown must be sick just like our country is right now. Where is the pride here? Shame is here. Did they save tax payers money after factoring in unemployment, homelessness, jail time, local economies etc.? Cheaper? No. What is the matter with this country and the higher ups that are supposed to be running it. I wish that some newspapers would join in protesting this kind of outsourcing and these expensive celebrations that shows off the good work that the Chinese do. Now look at the BART cars and operating systems and the new to come Brown’s hi-speed trains, all material from France We only put things together after we send money over there and the product gets here by foreign ships. Somebody ought to get the word out and then others should work to keep the word rolling. Then the right people have to work hard to put this country back together again. The wheel has to squeak first in order to fix it. So squeak to the right people. We must have, whenever possible, projects and jobs that stay here. The leaders of this country have to make an honest effort to make a comeback. It appears that at this time our leadership stinks. Maybe we all are just like Jelly Fish now and have no backbone. We were given a good strong country by good strong leadership with good regulations. Now we can’t even take pride in a new Oakland bridge. It is just as shameful as Oakland is at this time. The poor people in Oakland needed jobs not homeliness or jail. Get the word out: American workers avoid this Jerry Brown’s celebration on Labor Day. What are some solutions that worked as we look back to the forties through the eighties? Federal Government helped with tariffs and the agriculture industries by subsidiaries to keep them in business. Manufacturing and others could be helped in the same way instead of paying unemployment and jail costs. NAFTA was supposed to make things better for the USA. The truth of it all is at first it was only manufacturing workers that were suffering, the rest never cared. Now there are so many others that have given up looking for a decent job. Trade tariff is what kept this working country together. Now with NAFTA all large contracts have to go out for open bidding with other countries. Our own Government has shot us in the foot, no worse – the head! We are dead when it comes to open bidding with other countries. Simple fixes? Fix NAFTA, tariffs and government subsidies, like in agriculture, for manufacturing. NAFTA is supposed to be fair trade for all the World. It is not fair trade for our workers that have been accustomed to good working and living conditions. We have been hurt by NAFTA and it must be corrected by our leaders. Dow up over 1300. Who wants to change NAFTA now? **Guest Writer Mel Wolfe is a San Francisco native, a WWII Veteran, and a retired steel mill worker. His 40 year career at American Bridge ended when the South San Francisco plant closed because of foreign competition. Very well-articulated and passionate article Dad, I am proud of who you are and how you speak up and out, after seriously contemplating the issues.